A bitterly cold miserable day to end January with the old real progress being on the BSK with the last of the ceiling panels being sanded. 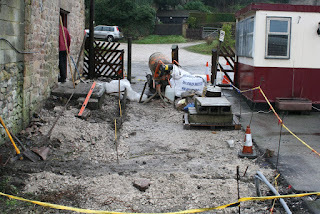 More electrical work on the fitting of the electric heat system took place too. The DMU group moved the Class 31 to the car park road ready for Mondays loading using three DMU power groups totalling 900 hp. It should be on U Tube tonight !! Another major leap forward today as the reconfigured slope outside the new Booking Office received tarmac. It looks fantastic! It's quite hard to imagine we used to eat our chips there not that long ago. 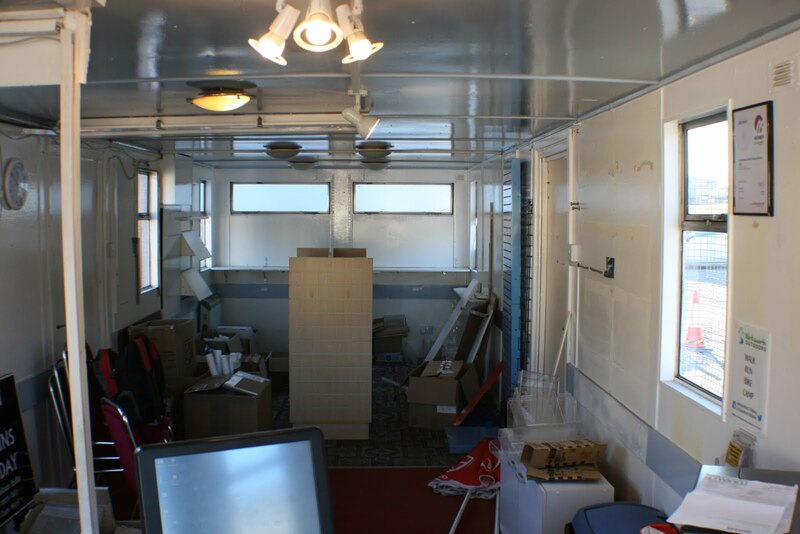 Inside, a team tended to some last minute snags and more items were moved from the old Booking Office. 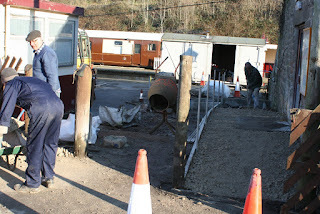 We had stone spread in the bottom car park to help solve the mud bath problem there. 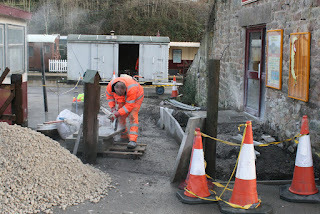 At Duffield a gaggle of clerk's started setting up the Brake Office Ticket Van which is there temporarily whilst construction takes place on a new facility there. BSK ceiling panels progressed in the shed. With a series of successful test customers we have felt confident to invest in our estate and the pictures show improvements to the Wirksworth Car Park following quite a hammering by heavy goods vehicles delivering and collecting test vehicles. 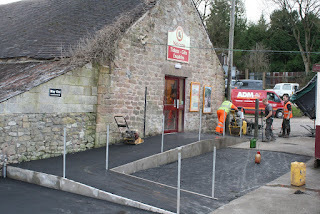 The second shows the tarmacing in progress on the area outside our new Wirksworth Booking Hall which was particularly satisfying for Chris, John and Geoff together with others that helped undertake all the preparation work. Hats off to all the team who have worked inside and outside the Booking Hall! Our Clayton locomotive left today for Plumstead to start earning its keep with Crossrail. The photo shows it ready for departure from Wirksworth. As Chris Ralls has advised his plea for help was answered by the DST (Dream Steam Team) which was a pleasant example of inter department co-operation. Here is a photo around mid-day of progress with ramp project. In the background some progress has been made with revenue that will allow our ambitions to continue. Next week we will welcome Neway Training to Wirksworth for an initial two week training programme which involves reprofiling switches and crossings by a grinding process. This will go some way to replacing ARC Training who are moving to Derby at the end of the month. A day which started with very heavy rain didn't turn out too bad in the end. 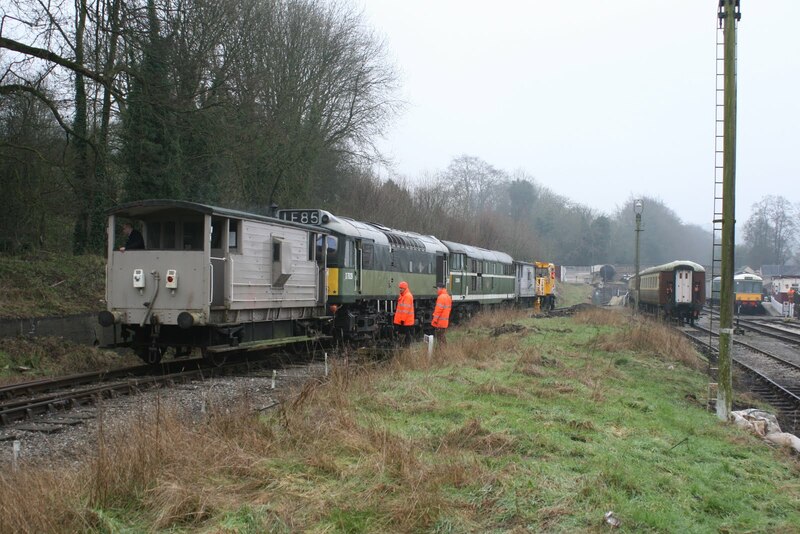 Our test customer tinkered with their locomotive lots today but also went on a run to Idridgehay. Derek worked on the BSK, dismantling and cleaning the lighting contactors. 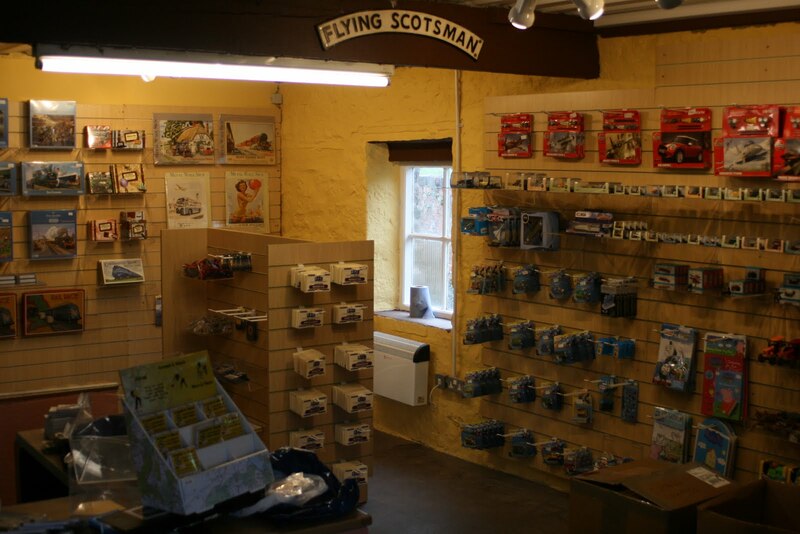 In the new Booking Office, further progress was made on the shop with pricing the products and ensuring the till back office is up to date. Also, more wall displays and things were done including placing the headboard and plaque from the visit of HRH on the wall. 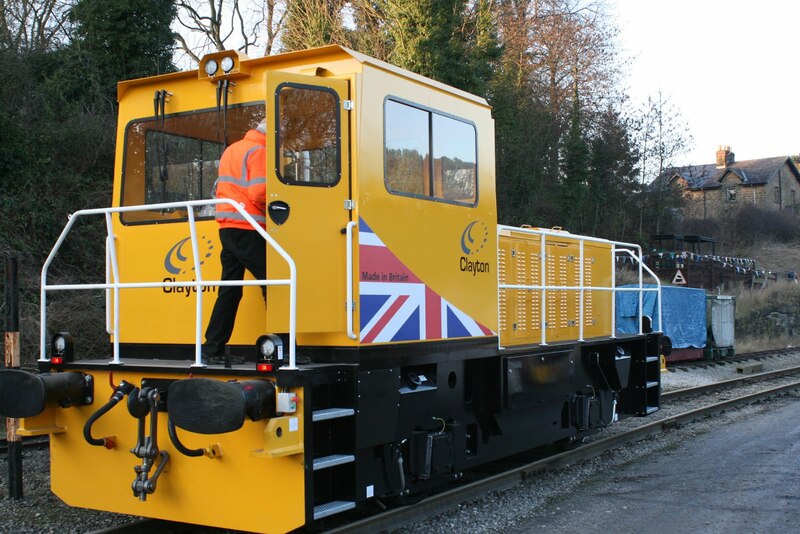 It's quite an accolade to be selected as the test centre for a locomotive that will spend most of its time moving under London to aid the Crossrail project to conclusion. 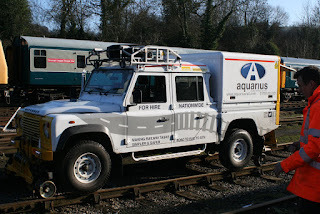 Today saw it passing through some of our test specific set pieces and then trial a substantial load towards Ravenstor. The video shows the locomotive in action under the watchful eye of the Clayton Equipment team and our hosts Rob and John. 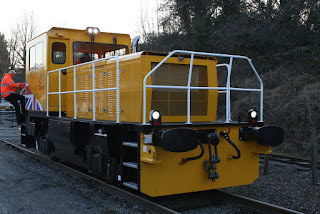 Really cold this morning for our test customer who are testing a rather dishy new locomotive destined for Crossrail. It has successfully negotiated the bridge rail and cant features already. The DMU team began examinations in preparation for the new season and progress continued on the BSK. A start was made in sorting through paperwork as the office move at Wirksworth continues. 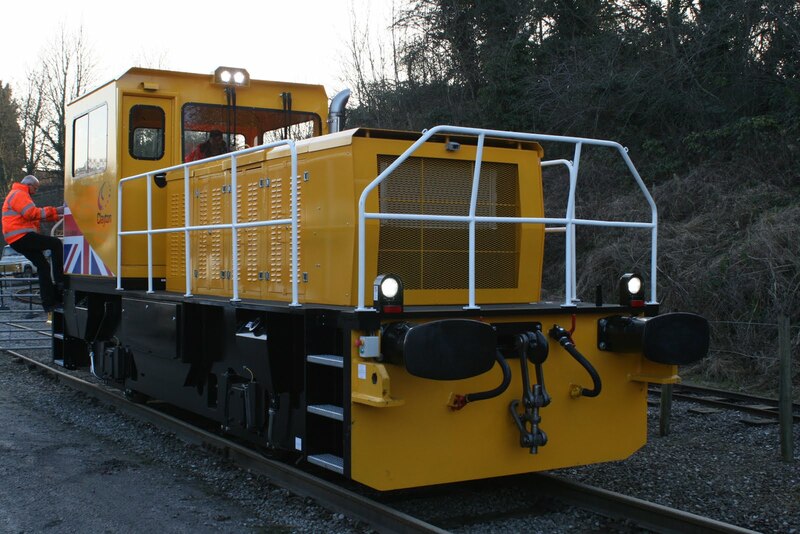 The reason for the second post was the arrival this afternoon of a brand new locomotive from Clayton Equipment which is to be put through its paces over the next 7 days prior to entering service on Crossrail for the fit out period. This is the first of seven being built by Clayton. 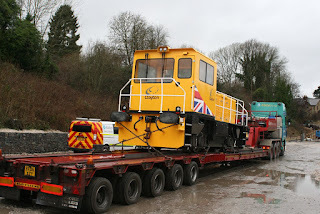 The video show the locomotive being unloaded at Wirksworth. Quite a day requiring two "supplementaries"! 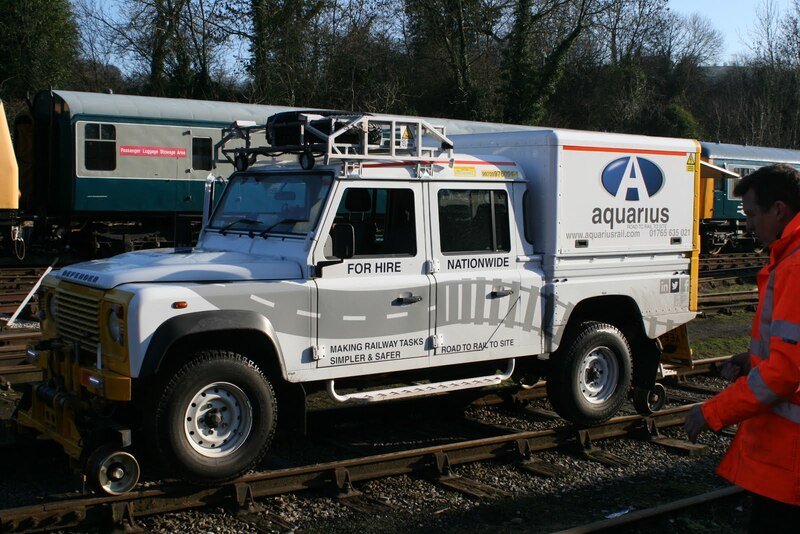 The photos show an immaculate landrover from today's test customer and further great progress with the new Booking Hall access ramp project. A short video of the small trailers that were under test today. 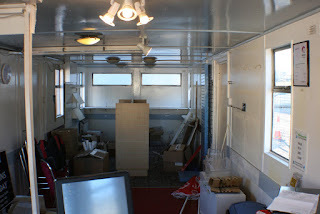 The Pway team moved their mess room and new tool container to the site of work between Hazlewood and Duffield. 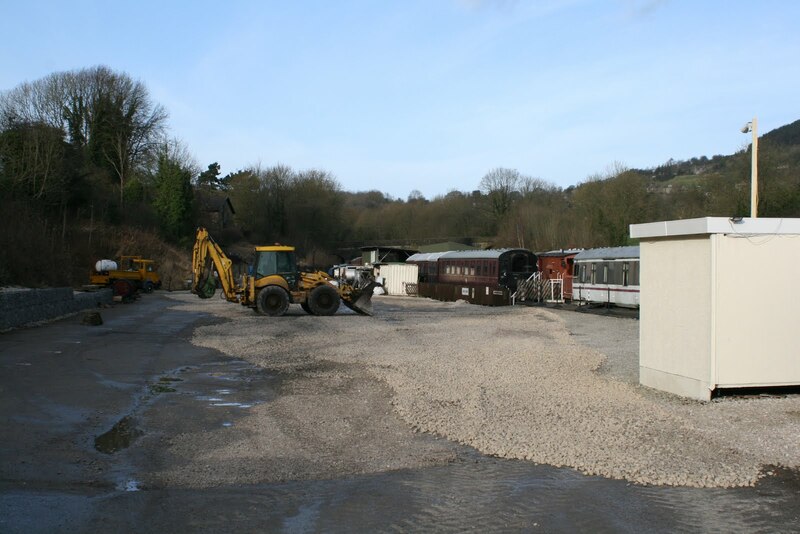 This stretch requires sleeper changing, extra ballast and one wet area which requires track removal and drains installing. 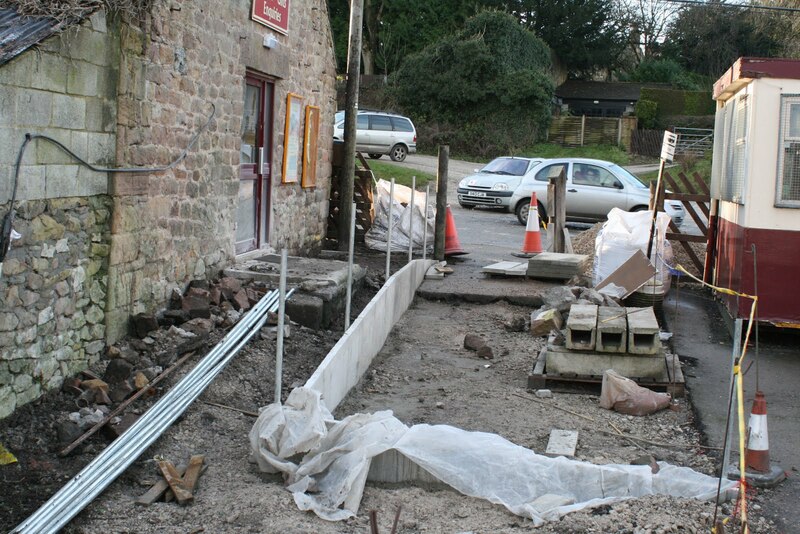 Much progress inside and out with the new Wirksworth Booking Hall with opening day not far away! Thank goodness for mobile data as the site is engulfed by a town-wide power cut I can still send you today's progress. Dan continued welding on the BSK whilst Rob did a few bits and bobs. There were very few volunteers on site to be honest with only the LMSCA making progress on the TO and the 8F chaps making progress on The Duke. The contractors worked on the exterior refreshment of the Conference Room. I took a picture but it was quite dark! A full compliment of volunteers in Team Tannery today with much progress being made, ticking things off the list, as we hurtle towards the season already. 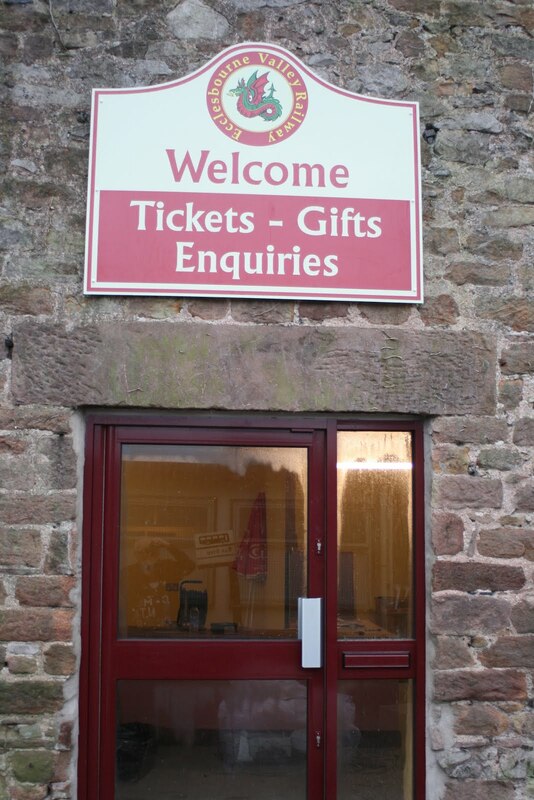 Stuart and Bill put up the Tourist Information boards, Martin fixed the ill-fitting internal fire door and put a keep on the exterior fire door and Brian recessed the wood on the store door. 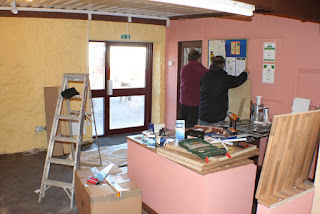 Nathan and Andy made a start on putting up shelves in the admin office section and cleaning product display shelving. Some products were brought across towards the end of the day but still a long way to go. 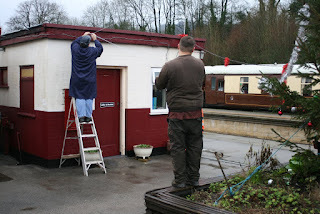 Elsewhere, the P W team S&T Division did the routine groundframe checks which have to take place and Derek and Dan worked on the BSK refurb. The old and the new - the old Booking Hall becoming a shell as stock and usuable display material is moved to the new "old" Booking Hall. The premises are really a step change and enjoyed the labours of a team of six today. Today's video was rescued from a tape made in 1997 of the Bristol Electric Railbus commencing trials on the Bristol Harbour Railway. 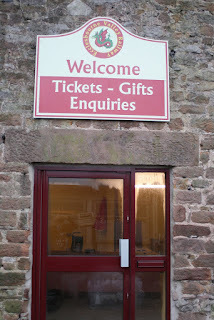 The connection with us is that, after a couple of years running between the Industrial Museum and ss Great Britain, the funds ran out and we were asked to store it at Wirksworth. The hope was that trials would be funded with us so that it could be demonstrated to potential purchasers. It all ended in tears with the vehicle returning to its builders in Cradley Heath and I believe it was destroyed by fire whilst stored there. I suspect it was before its time and had questionable engineering. Others are now emerging to develop the concept of Ultra Light Rail. 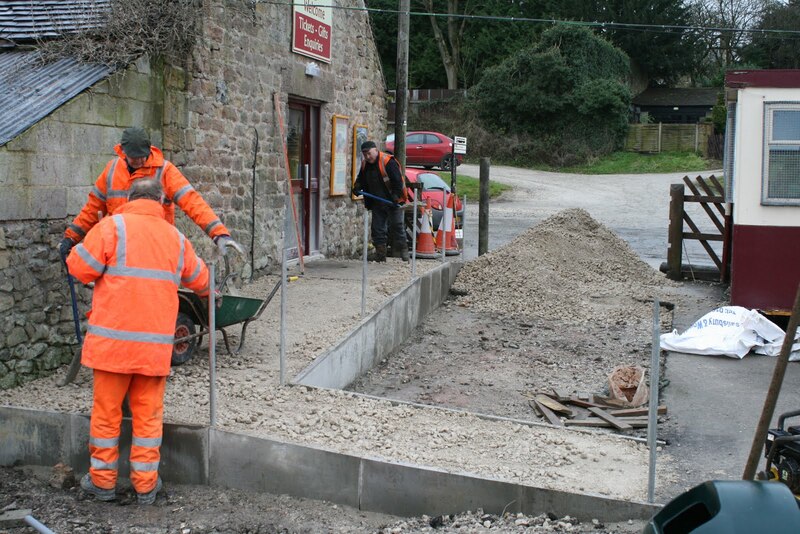 Another view of the ramp works to the World's oldest working Railway Booking Office as it steadily takes shape. The DMU duo swapped the BSK and their stores coach to opposite sides of the maintenance facility. Not an easy task with LJ Breeze being stabled at Shottle for the winter period. Work moved forward on to create an access to the World's oldest Railway Booking Office - yes, you heard it here first! The oldest Railway Booking Office in the World. There were more people involved but only John wanted his photo taken. The main project of the day was the continuation of the wiring in the new booking hall for the internet and phone system. It still looks like spaghetti junction !! New Years Day seems like an age ago yet it was last Friday. Where does the time go? Not too many on site today with Derek and Dan progressing with the BSK. Much wood to be cleaned, stained and varnished. 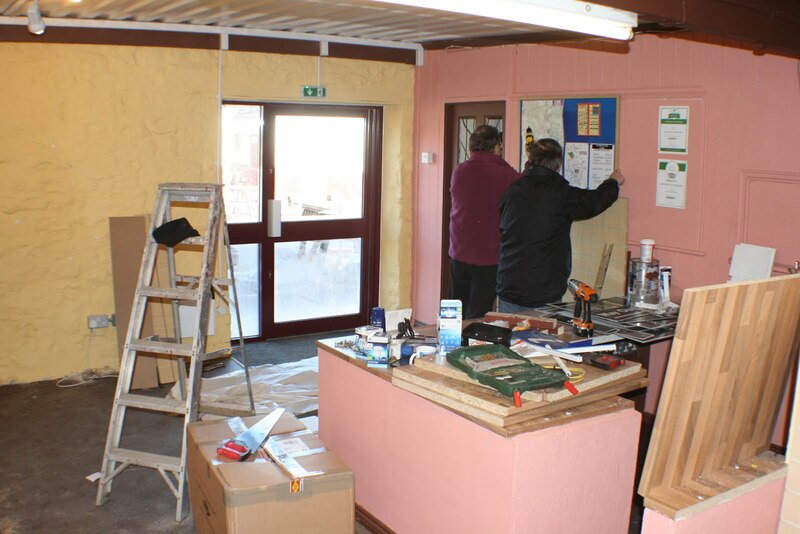 Nathan and Andy worked in the new Booking Office putting display boards on the wall recovered from the outgoing Booking Office. You may no doubt have read by now that the new Booking Office is going to be in a former Tannery adjacent to the platform at Wirksworth although it is far from new. I have been conversing with the building owner recently to find out a little more about it. It seems the building was build around the 1750s, although the deeds are written on velum so he doesn't want to handle them and gave me that date from his memory. The building was originally used by an animal skin company to store the raw hides before being sent to a tannery. Around the turn of the 1900s, the building became associated with the railway although not through the Midland Railway but through a company called Fletcher Brothers who dealt in animal feeds. Apparently, the animal feed was brought to Wirksworth Station by rail and loaded into the building via the doorway which we have recently opened up once again. For whatever reason this doorway had been bricked up at some point but it will now form the main public entrance. The area inside the building which we are to use as a store room was the Fletcher Brothers office which is still in situ. 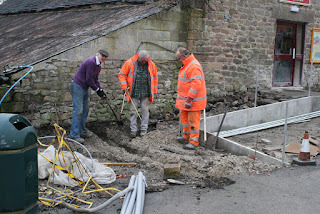 It is suspected that this is when the mezzanine floor which we are using was put in because prior to the railway being there, the ground nearby was somewhat lower! The whole complex of buildings in which the building belongs is known as Newbridge Works. Initially I had thought that this was named after the new railway bridge but no, it was named after the original river bridge which was built across the Ecclesbourne for horse and cart. The river now of course runs in a culvert built by the Midland Railway right the way under the yard. Very quiet on the volunteer front at Wirksworth today with the majority being just south of Hazelwood sleeper changing. 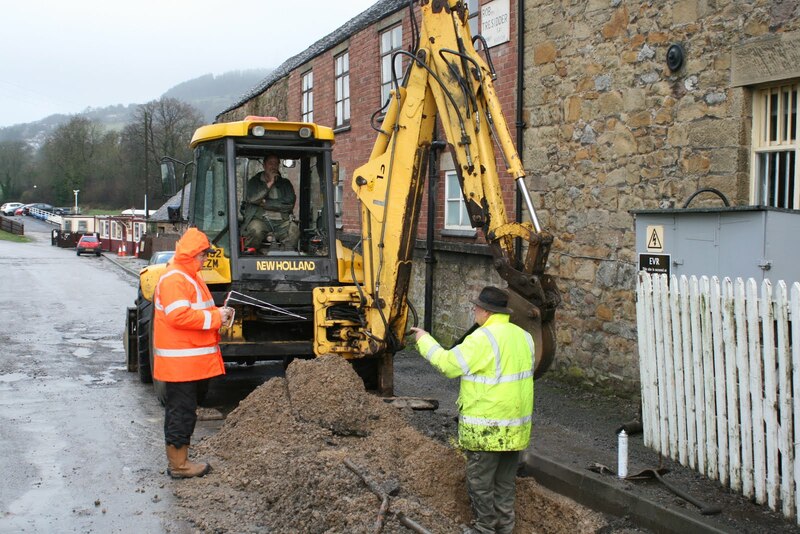 This is part of an important winter works programme. We did host a MyTestTrack customer who brought two road/rail diggers for a run round the yard. Piccy attached. The DMU team did some work on the beautification of their coach and as I left, the mess room was benefitting from some new lino which was spare left over from that laid in the new Booking Office on Tuesday. 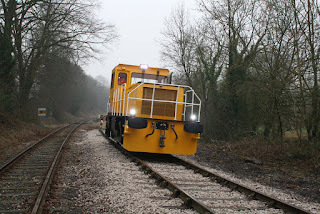 The PWay team took the works train to Shottle and began the task of sleeper changing between Hazlewood and Duffield. An illustration of the challenge facing the Ralls-Silvester building team, famous for their work at Duffield and Shottle, as they move forward with the ramped access and egress to and from the new Booking Hall. As with all building projects it always looks worse than it is until the final touches are made. 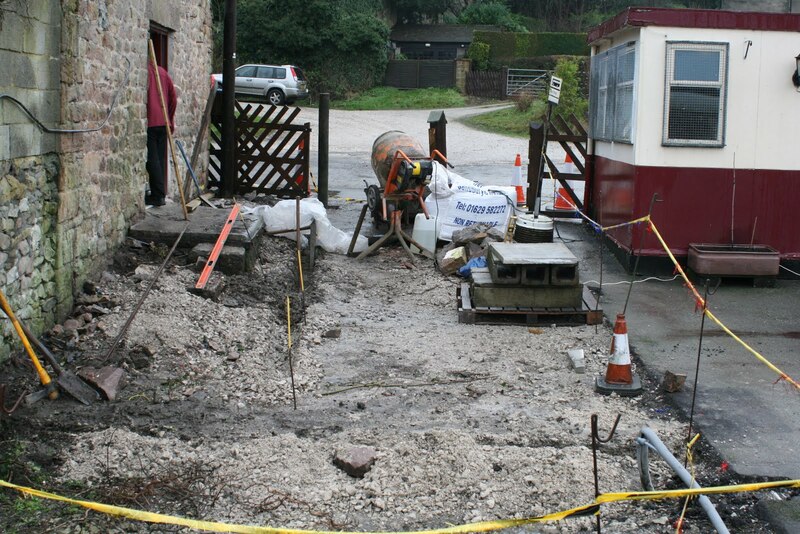 The second illustration is of work needed to an expensive water leak at the head of the Wirksworth station approach. Unfortunately the life of the Midland Railway water pipe we originally we plumbed into some 15 years ago has finally expired requiring an expensive fix. One of our personnel, described as the "Divine Rodney" is observed assisting the contractors. The dry weather allowed Mick the flail to clear vegetation down the racing straight. A job well done !! Despite the drab and gloomy weather we ran Iris on the Service Train which proved to be productive. Maybe people were out to enjoy some fresh air after the Christmas an New Year festivities. Good news for all ! On a dull, wet Saturday the new Booking Hall signage certainly makes clear where this facility is located. As part of the preparation for the opening on 5th February John and Graham Stokes together with Leigh erected a catenary wire between the Ladies and the Tannery building to support an earth wire and telecoms cables which were affixed later in the day. It is good to see this project coming together nicely. Much more seasonal this morning with it being -2 and icy on arrival for the first service day of the season. We ran our new timetable for the first time and all seemed well so far. We had many happy customers enjoying a splash of fizz and a mince pie.